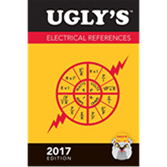 Updated for the 2017 National Electrical Code® (NEC®), Ugly's™ Electrical References is THE on-the-job reference for electrical facts and safety data. Depend on Ugly's Electrical References for fast and easy access to information you need on every electrical job. This renowned resource works hand-in-hand with the 2017 edition of NFPA 70®: National Electrical Code® as your quick reference to the most current NEC tables, wiring diagrams, NEMA enclosure types, voltage drops, conduit bending and conduit fill information, formulas, and more. The 2017 edition is revised and updated, with expanded coverage of alternative energies and the latest electrical safety information. Used worldwide by electrical professionals, Ugly's is an industry staple.